The medial collateral ligament (MCL) is one of four major ligaments that are critical to the stability of the knee joint. A ligament is made of tough fibrous material and functions to control excessive motion by limiting joint mobility. The four major stabilizing ligaments of the knee are the anterior and posterior cruciate ligaments (ACL and PCL), and the medial and lateral collateral ligaments (MCL and LCL). The MCL spans the distance from the end of the femur (thigh bone) to the top of the tibia (shin bone) and is on the inside of the knee joint. 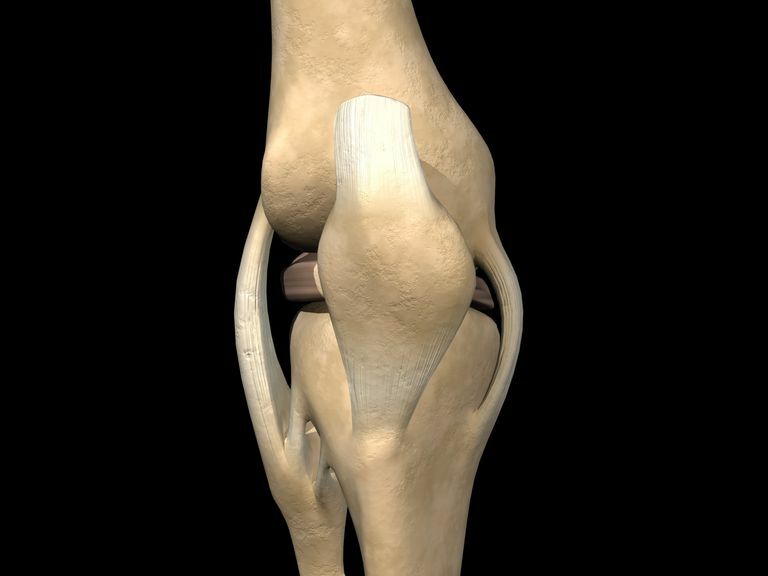 The MCL resists widening of the inside of the joint, which can be thought of as preventing "opening-up" of the knee. If the MCL is completely torn, the injury will cause the joint to have an additional 2 degrees to 5 degrees of laxity. If other surrounding soft-tissues are damaged, then the amount of laxity will approximately double. The MCL is not the only restraint to excessive opening on the inner side of the knee, but it is the primary restraint to this movement. Because the MCL resists widening of the inside of the knee joint, the ligament is usually injured when the outside of the knee joint is struck. This force causes the outside of the knee to buckle, and the inside to widen. When the MCL is stretched too far, it is susceptible to tearing and injury. This is the injury seen by the action of "clipping" in a football game. An injury to the MCL may occur as an isolated injury, or it may be part of a complex injury to the knee. Other ligaments, most commonly the ACL, or the meniscus, may be torn along with an MCL injury. In order to prevent the possibility of an MCL tear, some athletes use braces to prevent excessive force on the ligaments. These are most commonly worn by American football players, particularly lineman. These athletes are often subjected to high lateral forces on the knee joint, a mechanism that can lead to MCL injury. The utility of these braces is a subject of debate, but there is probably some small benefit in terms of preventing the likelihood of injury when a brace is worn in these situations. The most common symptom following an MCL injury is pain directly over the ligament. Swelling may appear over the torn ligament, and bruising and generalized joint swelling are common one to two days after the injury. In more severe injuries, patients may complain that the knee feels unstable, or it feels as though the knee may 'give out' or buckle. Symptoms of an MCL injury tend to correlate with the extent of the injury. MCL injuries are usually graded on a scale of I to III. This is an incomplete tear of the MCL. The tendon is still in continuity, and the symptoms are usually minimal. Patients usually complain of pain with pressure on the MCL and may be able to return to their sport very quickly. Most athletes miss one to two weeks of play. Grade II injuries are also considered incomplete tears of the MCL. These patients may complain of instability when attempting to cut or pivot. The pain and swelling is more significant. Usually, a period of three to four weeks of rest is necessary. A grade III injury is a complete tear of the MCL. Patients have significant pain and swelling, and often have difficulty bending the knee. Instability, or giving out, is a common finding with grade III MCL tears. A knee brace or a knee immobilizer is usually needed for comfort, and healing may take 10 to 12 weeks. One abnormality of the medial collateral ligament is the Pellegrini-Stieda sign, which is often seen in chronic MCL injuries. This abnormality is seen on an X-ray when calcium deposits are seen in the MCL. Typically, the calcium deposit is next to the attachment of the ligament to the end of the thigh bone. People with pain in this area are sometimes said to have Pellegrini-Stieda syndrome. Treatment of this condition typically responds to simple steps, although in rare cases the calcium deposit can be removed. Treatment of an MCL tear depends on the severity of the injury. Treatment always begins with allowing the pain to subside and beginning work on mobility. It is followed by strengthening the knee and return to sports and activities. Bracing can often be useful for the treatment of MCL injuries. Fortunately, most often surgery is not necessary for the treatment of an MCL tear. Miyamoto RG, et al. "Treatment of Medial Collateral Ligament Injuries " J. Am. Acad. Ortho. Surg., March 2009; 17: 152 - 161.